Stillwater was platted in 1848, a town of about 600 people, nearly all lumbermen. When Wisconsin entered the union that year, leaving lands now in Minnesota without government, delegates from the area met in Stillwater. The Stillwater Convention that August appointed Henry Sibley to petition Congress for the early organization of Minnesota Territory. Minnesota became a Territory on March 3, 1849. The first Minnesota Territorial Legislature named the county Washington and confirmed Stillwater as its county seat. 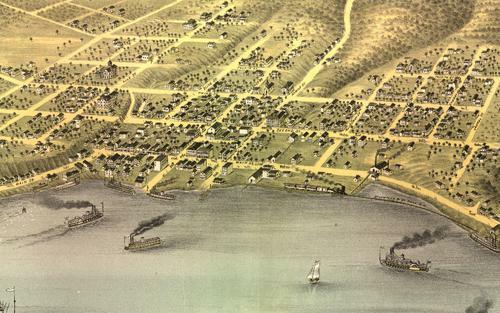 On March 4, 1854, Stillwater was incorporated as a city. John McKusick, the man who had named the community for Stillwater, Maine, was elected Stillwater’s first Mayor. Within a year of Minnesota becoming a territory, the decision was made to locate the territorial prison in Stillwater. The prison was completed by 1853 in Battle Hollow, a natural ravine north of downtown. The ravine got its name from an incident that occurred in July 1839. Both Dakota and Ojibwe parties had visited the Indian Agent at Fort Snelling. There had been a quarrel, and when the Ojibwe party started for home, the Dakota pursued them. The Dakota came upon their enemies encamped in the ravine and fired on them, killing 21. It was rather a one-sided battle, but one of the last confrontations for these two nations. Stillwater had all the ingredients for a lumbering town: river connections to the northern Minnesota and Wisconsin pine lands, still waters for assembling rafts, and water power. In the 1850s huge steam-powered mills and a log-holding boom were built and Stillwater became the supply depot for the entire St. Croix valley. Early stage roads connected the city to St. Paul, Marine, and Point Douglas. Railroads arrived in Stillwater in the early 1870s, vastly expanding markets for timber and manufactured goods. The first rail line, a branch line of the Mississippi & Lake Superior (now the Northern Pacific) from White Bear Lake, entered town from the north. The second, the St. Paul, Stillwater & Taylor’s Falls (now the Omaha Road) came from the south. Soon the city was connected to Chicago through the Milwaukee road (via Lakeland and Hastings) and in the 1880s via the Soo line. As the sites near the rivers were logged out, logs began arriving in Stillwater via rail. Manufactured products ranging from lumber and shingles, windows and doors, furniture and flooring, to farm machinery, steam engines, and rail cars—as well as grain, feed, and flour from the elevators—were shipped to customers in Minnesota, Iowa, Missouri, Nebraska, and Dakota Territory via rail. Stillwater entered a golden age that produced the grand homes of the lumber barons, the biggest opera house west of Chicago, and many magnificent brick buildings on Main Street. It had gas lights in 1875, telephone service downtown in 1878, and the first electric lights west of Chicago in 1888. The city also boasted as many as 46 saloons and was home to six breweries. In June 1889, the first electric street railway in Minnesota began operation in Stillwater. By 1900 the lumber was giving out and the mills closed. The final failure of the largest manufacturer, the Minnesota Thresher Company, in 1914 coincided with the last lumber rafts leaving Lake St. Croix and the moving of the state prison to South Stillwater, and began Stillwater’s rapid population decline as workers moved away. However, the diversity of business in Stillwater prevented it from becoming a ghost town. The Muller boat works, Connolly Shoe Company, Simonet Furniture Company, farm equipment makers, flour mills, and elevators kept operating. The Twin City Forge & Foundry survived by building barges and making munitions and shell casings. As the jobs left, Stillwater’s population declined from a high of more than 13,000 in the 1880s to a low of around 7,000 in 1940. The Forge closed in 1930; the Omaha took out its tracks in 1935. However, the population began to recover after World War II when good roads and automobiles put residents in commuting range of the Twin Cities. In the 1970s the first planned residential developments were built west of downtown and a “strip” of businesses appeared flanking Highway 36. Stillwater began to reinvent itself as a tourist destination. Fabulous old mansions got new life as bed and breakfasts. Old waterfront buildings were torn down (some regrettably) and others were reused. Restaurants were installed in the beer caves and freight house, shops in the old utility buildings and mills, and a hotel in the old Lumberman’s Exchange. In its third century, Stillwater is a bustling community boasting a variety of industry and business from automotive and plastics technology to government, banking, and medical services.